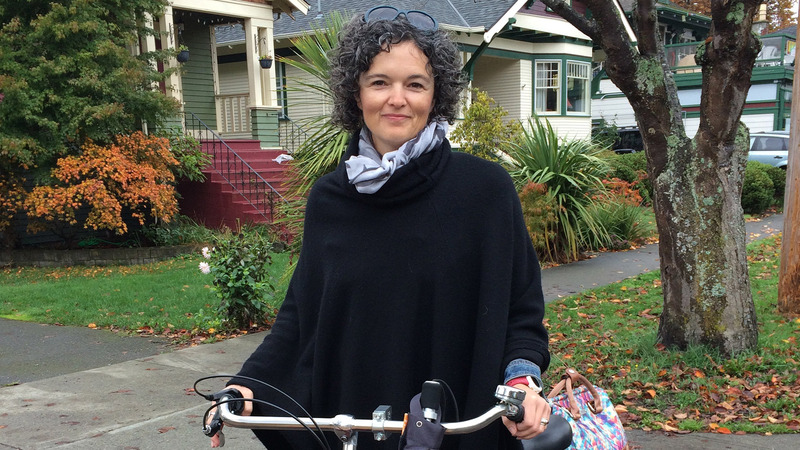 My name is Susan, I am the Bicycle Mayor of Victoria and the first in Canada. My focus is on the normalization of cycling in a region where sport and recreational cycling is the norm. Cities around the world are implementing purpose-built infrastructure to promote cycling. Victoria has the mildest climate in Canada and moderate topography, it’s the perfect location to experiment and design a city for people. My purpose is to spread the message of how cycling positively transforms cities. It’s time for our citizens and our city to think beyond the automobile and join the cycling revolution that’s spreading across the globe. Building a multi-modal city that enhances the places we live, work, and play that deeply impacts our health and wellbeing and shapes our experience of a neighbourhood is a vision that I think everyone can see themselves in. How would you describe your mission? One of my missions as the Bicycle Mayor will be to normalize cycling in a region where sport and recreation cycling is the norm. To elevate cycling, as a normal everyday activity that millions of people partake in every single day will form the cornerstone of the work I want to accomplish over the next two years. I believe that cycling can touch people’s lives in the most profound ways by the way we interact with each other and our environment. Taking ourselves out of the car bubble and into the streets as cyclists and pedestrians allows for a stronger connection between citizens. The social consequence of a normalized cycling culture builds trust and confidence and permeates every aspect of social life. Cities around the world are implementing purpose-built infrastructure to promote cycling and I believe we can build on the good work that has already started in our city. What are the obstacles and challenges you are facing in your city? One of the obstacles I’m facing at the moment is reaching out to the identified 60% of would-be cyclists. We need to hear their voices and have them be represented at the planning table. The more people we have on bicycles riding in our city streets the more urgent it will become to focus efforts on protected bicycle infrastructure. Connecting with them is something that I feel is important and something I will be focusing on. An important aspect of creating a healthy city is that the city is build with children in mind. Ten per cent of the world’s school-aged children are estimated to be carrying excess body fat, with an increased risk for developing chronic disease. There are many studies that show that movement before and after school helps children to learn better and stay healthy. I would like to work with the local partners on a campaign to get more children cycling in a safe and independent way with the aim of ensuring better accessibility to schools. It’s a lofty goal worth pursuing. Another obstacle I see is in relation to media and messaging (how we visualize and speak), about cycling and what it can mean for a city and its citizens. Marketing and media messaging remains a relatively underutilized planning tool and several studies have noted the potential value in marketing as an instrument to normalize cycling (utility), to increase bicycle use and to promote cycling policies. This is something I believe is critical to the work I want to accomplish and improve on. What are the next steps now that you are the bicycle mayor? My next step is to reach out to the good folks at City Hall and start conversations where we can collaborate on initiatives. With the goal of stimulating cycling and showing the normalization in it; we have plans for storytelling events where we’ll share personal and inspiring stories relating to the power the bicycle has in creating livable cities. It’s really a 21st century tool to unlocking healthier, happier and more human-centric cities. Place-making activities and pop-up events are where we will have another opportunity to engage with the public. We want to know what kind of livable city they want to live in, their desires and how we can experiment through place-making to encourage people to follow their dreams. What can other cities learn form your city? Well, I think other North American cities are facing similar issues with regard to sport and commuter cycling as being the norm. It’s reaching out to the larger group of would-be cyclists and getting them to show up at events and to make a big noise for separated infrastructure, it’s going to get things moving along a lot faster. If we use Amsterdam as the role model for this approach, it took a number of decisive events for Amsterdam to succeed in becoming the bicycle capital of the world. It was fierce activism (public outcry), social change (1970’s oil crisis), and strong political will to take the first steps in becoming a truly cycling city. It didn’t happen overnight in Amsterdam and it won’t in our cities either. We’re in this for the long haul. One of the most important lessons I brought home with me from my studies abroad at the University of Amsterdam is that it’s the people moving through the streets that matter most, not moving automobiles. The safety of the streets in the Netherlands is set up for people. The social consequences of a normalized cycling culture are far reaching and we think it builds trust and confidence and permeates every aspect of social life.